Last week, I made my case regarding the unconstitutionality and utter disregard for the Constitution by the Trump administration when the ATF issued its illegal bump stock ban followed by an expected lawsuit to challenge it. What's even more hypocritical in the unlawful rulemaking by the corrupt Fast and Furious gun-trafficking agency known as the ATF is that they didn't even mention echo triggers. 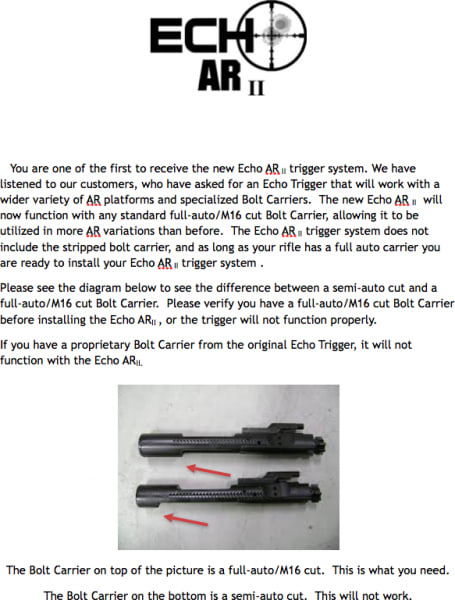 In case you are not familiar with what an echo trigger is, it looks similar to a normal trigger. The only difference is in the selector switch. The Echo Trigger is a revolutionary new pull and release trigger from FosTecH that has a groundbreaking drop-in design that is approved by the ATF. This is the Gen II Echo Trigger and does not require the proprietary bolt carrier body in order to function like the original Gen 1. Works with any standard full-auto style bolt carrier group which 98% of all rifles currently come with. Not sure if you have a semi or full auto bolt? Click this link for details. Safe Mode: Firearm will not fire. Semi-Automatic Mode: Firearm fires when the trigger is pulled. Echo Mode: Firearm fires when the trigger is pulled and also when the trigger is released. Yes, it is ATF approved, and you know what? Since we gave the federal government no authority to restrict or regulate arms, even without their approval, under our Constitution, it is just as lawful to own as a bump stock or, I might add, a full-auto machine gun. Take a look at the functionality of this little gem. If you're asking, "Isn't this a violation of the one pull, one shot definition of a machine gun?" that's a good question. You'll notice that there is a mention of the safety switch being able to be selected as the trigger is pulled before release, keeping the device firing a second time with the release of the trigger. This was addressed by the ATF, and I might add that it was the ATF under Barack Hussein Obama Soetoro Sobarkah, in their approval letter. If you're looking to pick one up, today, December 21, 2018, you can get one for $100 off at Classic Firearms in their Deal of the Day here. I bought one... just cause I could. What's interesting is that these have hardly even been in the news and yet when it comes to results, this trigger works similar to a bump stock, and I find it to be a whole lot more accurate. So, why no coverage of the echo trigger? Because these have not become as popular just yet as the bump stocks. Following the Las Vegas shooting where bump stocks were mentioned, even being attacked to rifles with a bipod, which if used in conjunction with a bipod would defeat the purpose of having the bump stock in the first place, bump stocks started being targeted nationally through legislation, unconstitutionally of course. My guess is that if the bump stock ban somehow is able to weather the lawsuit against it, which it shouldn't be able to do, then echo triggers will be right behind them, and eventually the semi-automatic guns themselves. It's time we put the federal government in its place and eliminated the unconstitutional ATF. We don't have prohibition anymore. Tobacco is legal, and arms are protected under the Second Amendment. There is nothing truly for them to enforce.